Bonds were technically stronger today. There is green on the screen right now for everything but 2yr Treasuries. It's not huge, but at least it's in the right direction. 10's ended the day down nearly 2bps and Fannie 3.5 MBS were up an eighth of a point. There is, however, a catch. 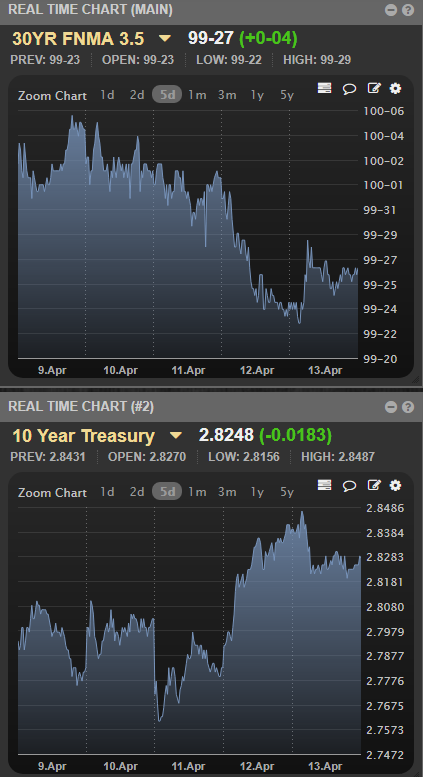 It quickly becomes apparent if you happen to look at a 5-day chart of MBS and Treasuries as opposed to a 2-day chart. Point being: today was better than yesterday, but not enough to erase yesterday's damage. Bonds basically leveled-off right in the middle of the weaker half of yesterday's trading range. Not only that, but 10yr yields broke back above the 2.795 technical ceiling. If they hold over 2.795 on Monday, it will be the first time we've had back to back closes in the 2.8+ territory since before the trade war drama began on March 26th. Stocks continue to have a material impact on bond trading at the moment. The most obvious conclusion here would be that markets are generally considering the "risk-on vs risk-off" implications of trade tensions. But there are other variables to consider, such as the fact that earnings season kicks into high gear in the 2nd half of the month and that money managers are flush with last-minute retirement account cash due to the tax deadline. Both of these factors contribute to further stock/bond interdependence. With that in mind, stocks are knocking on short-term ceiling established after the trade war drama. If they find reason to break through next week, bonds are likely along for the ride. Bryce Schetselaar : "consolidation is coming"
Jason Anker : "just priced something a client says he can get and it was 00.568"
Bryce Schetselaar : "I have heard in the last week or two that the online lenders are dropping way way low to get deals. Its not sustainable and can't last too long"